This weekend has been all about R & R, after a pretty big week. I pottered and slept and sewed and haven't cooked a single meal. Mr. P has taken charge of the washing so we don't have to go to work naked this week, and it's been pretty much a case of every (wo)man for him/herself with everything else. I've been valiantly trying to make some sort of discernible progress on my unfinished projects the last couple of weeks. With 53 days until the end of the year I'm going to have to pull several rabbits out of hats to finish the three quilts that I set myself as goals for this quarter. That's a finish every 17 days...which makes me want to involuntarily pee in my own pants every time I think about that kind of pressure. So you know what? I'm not going to think about it. I'm going to just plod along and hope that yields results. I finished my Sampler blocks for October/November in Amanda's Sampler Along so Im feeling pretty chuffed about that. Yes- I made rather obvious errors putting them together and didn't notice until after I had IG'ed them. I don't care - they're staying that way. This is an exercise in technique and colour for me. It doesn't have to be perfect. I made a fair bit of progress since I last showed off my Miss Elizabeth project which included sewing lots of hexies together and basting some for the next few of rows. Maybe this won't take me years to finish after all? 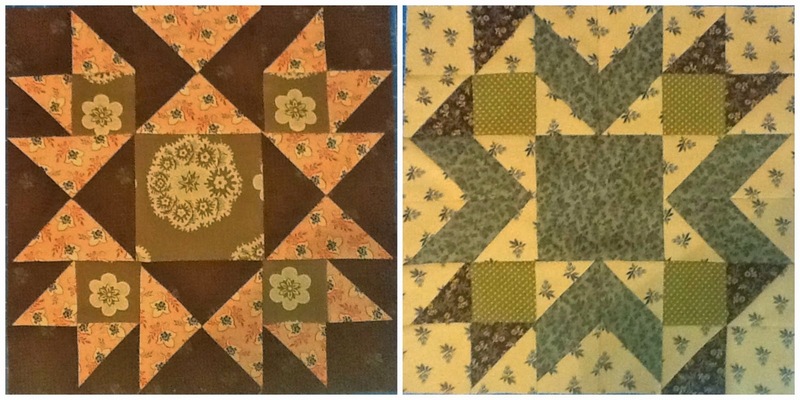 I started my Charming Stars Quilt and got 6 out of the 16 blocks that I need finished. I had a last minute change of heart about the fabric for this quilt. I was originally going to use my Bliss Stash but went with Curio instead and now I'm wondering if those colours will really work for this layout. No matter - if I don't love it I think I know someone who will, so it won't go to waste and I can always make the Bliss one up another time for myself. Speaking of which, I have already started my tentative quilt list for 2015. It's looking quite full already. Marrakesh is all basted and now I have to make some sort of decision about the quilting...and translate that into action. It would be nice to do something other than meandering. This week is all about putting one foot in front of the other and moving forward. Hope your week treats you well. That would make me pee my pants. I stopped setting deadlines a long time ago. I'm happy with two blocks a week. Love the blocks the way they are. You amaze me every time with your committment. I hab´ve one quilt on my quilting Frame which has been sitting there untouch for the last month or so. 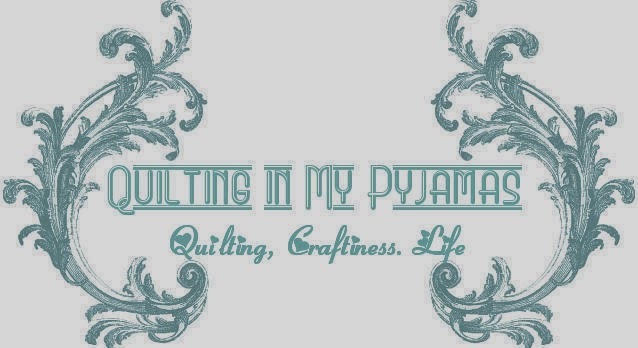 And i am alredy freakig out cause i have two quilts I am working on at the same time. You rock woman!! Love your quilts - every single one of them! Weekends really should be longer than weeks! I do love your Marrakesh, looking forward to seeing how you quilt it. Mr P is an unsung gem, don't let him go whatever you do! Way back when I was a mere teenager a friend said she thought that we should have Friday off to get us used to the idea of the weekend, then the weekend to enjoy, then Monday off to recover......I reckon she was onto something there, yes? As a friend in England said, "Small bites of the elephant and you will soon be done." Hope you manage to get done what you want done by the end of the year. I think your blocks are really cool with their special quirks! You're reinventing them. The colours you've used are wonderful, great use of value. You're making good progress on all your projects, You just might get them all finished by the end of the year. I think the more Charming stars blocks you make the more you will like it. But your right you can always make Bliss up as well! After you go to the quilt show next week, you will be inspired by all types of quilting ideas - simple and difficult...so dont forget your camera! I am sorry to hear that your furry orange friend departed this earth, I am sure he is in a happy place. Marrakesh is my favorite - vintage-y, bohemian, and classic all at once. For some one who has had a laid back weekend you sure have achieved a lot. I'm loving Marrakesh. Is that the backing at the top of the photo? Your Chocolate Marshmallow blocks have a fall feel to them, like the autumn leaves. I had to unsew a couple of parts on my versions, but I caught the errors before I assembled the blocks. I like your Charming Stars. I considered starting that one, but I have 21 quilts on the UFO list. Good luck with your quilty goals. Just keep plugging, you'll have your finishes in no time. Quite ambitious .. I haven't even thought about what I want/need to accomplish by 12/25. Very great that Marrakesh is basted and ready for quilting. Are you doing it yourself or sending it out? I love that you set the bar high for yourself and then pull out all the stops to meet it. I wish you success and fortitude and whatever else you need to get there! Wish I had some good ideas for quilting Marrakesh (I may learn to spell that right the first time eventually), but I'm coming up blank at the moment. Hope all your weeks go well. We are in at our new house, and what a mess!